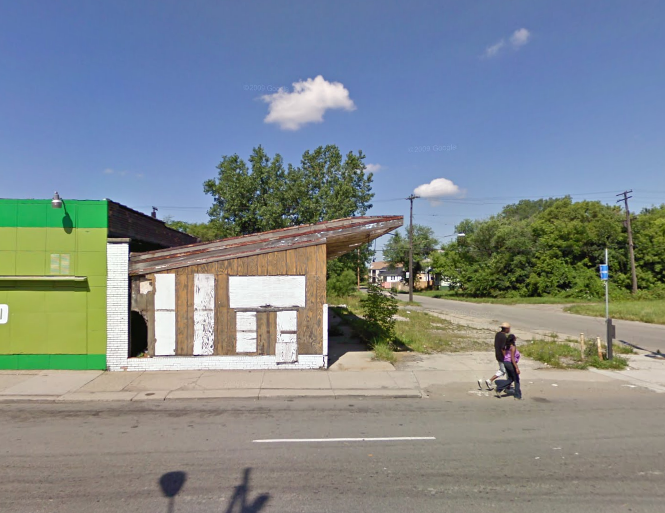 The incredibly colorful and vivid Faygo ghost sign above was recently uncovered on a Detroit liquor store after the neighboring building was demolished. Faygo is a soda product that has been produced in Detroit since 1907, when immigrants Ben and Perry Feigenson developed three soda flavors based on cake frosting recipes they brought over from Russia. The soda is still produced in the city at a factory built in 1935 a little more than a mile from this old sign. The bottling plant currently employs about 400 people. Faygo has always been known for its fruity soda flavors, especially red pop (strawberry). 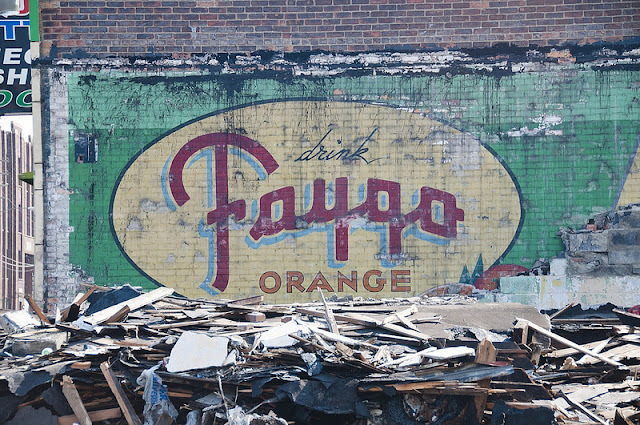 In the 1930s, Faygo began adding real orange juice to its orange flavored soda. I am going to guess (based on the font and what I was able to glean from old advertising) that this sign probably dates to the late 1930s or 1940s, before the Feigenson brothers handed over control of the company to their sons. According to legend, the company can be credited with the first use of the word "pop" to describe a soda product, as well as the invention of the twist-off cap. Today Faygo has the dubious distinction of being the official beverage of the Juggalo Nation. Behind that white brick wall were three ghost signs, two of which have not been completely revealed. 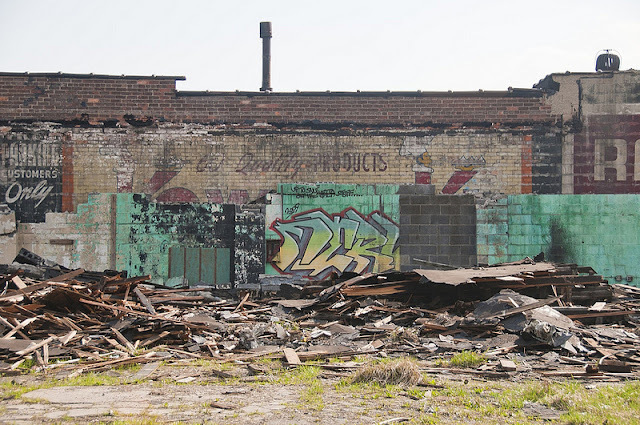 The second sign was for the Kowalski Sausage Company, which traces its roots to the smokehouse built in the back of Agnes and Zygmund Kowalski's grocery store on Chene Street in Detroit's old Poletown neighborhood. Today the sausages are still made in nearby Hamtramck, where the famous pierced hot dog neon sign lights up Holbrook at night, though sadly the company is considering moving from the location where it's been curing meat for 90 years to some dreary suburban industrial park. The last sign hasn't been completely revealed. All we see is the word "Ray's." 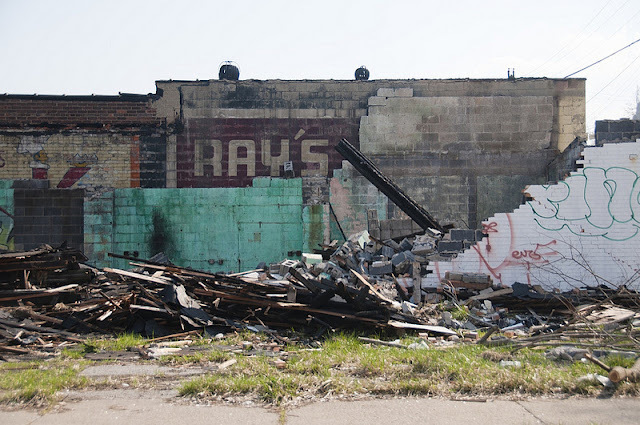 This is my third post about ghost signs here in Detroit (the second was discussed in the New York Times a few weeks ago), and in that one I said it was "one of the strange pleasures of a city where demolition is so rampant and necessary: sometimes secrets of history reveal themselves." Now I am thinking about all the ghost signs hiding behind brick walls in other (functioning) cities that may never be revealed, some of them with colors like this one. That's kind of a wonderful thought too.